For a man in Cairo, getting a haircut is something of a terrifying prospect. You risk all manner of calamities such as fauxhawks, excessive gel and god only knows what else. Luckily, more and more high-end options for males are cropping up, and what better place is there to test out than Cairo mainstay, Mohammed Al Sagheer. On walking into the popular Zamalek branch, you will be immediately greeted by well turned out doormen. The men’s section is on the first floor, but that won’t prevent the elevator attendant from shepherding you into their glamorous little box. When approaching the desk, the receptionists are more than polite, offering refreshments and asking if you wanted to see a specific stylist. The stylist leads you round the corner to where the seats and wash basins are. You are given the choice of whether you want hot or cold water, and the fragrant shampoo makes for a pleasant experience. However, the chairs for the basin are not adjustable, which may leave the more vertically gifted amongst you uncomfortably contorted. The stylist will then lead you the seat in front of the mirror and ask what you want. The request was simple; a faded short back and sides, and a simple trim on the curly top; not an unusual or difficult request. However, instead of fading the lower sections, the stylist simply shaved it all one level on the sides, and applied a very rudimental fade to the back section. Instead of a trim, he took about a millimetre off of the front section of the hair. At this point, you will be directed back for a second wash, and then return to the seat for styling. Usually when you get a haircut, the stylist asks you how you brush your hair, and what, if any product you use. Instead, this stylist added a very heavy wax without as much as a word. The application was heavy-handed, uneven and left the final hairstyle looking rather greasy. 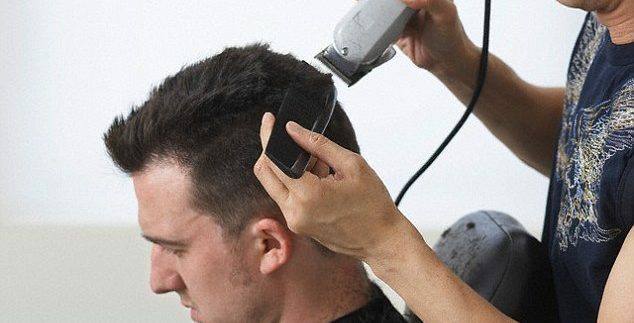 When met with requests to trim the top further, he refused, instead trying to reassure this reviewer that it looked fine and then simply walked away. For 70 L.E., it’s reasonably priced, but the customer service on this occasion left plenty to be desired. It wasn’t until later in the day when the awful product was washed out that the full disaster became clear. It looked like a mess without being professionally styled and coiffed, with lower sections of the top still being far too long and the shaved back being noticeably uneven. The moral of the story? Be very clear, very firm and don’t take no for an answer. They also sell a wide variety of different products and creams for the discerning male. Every customer is made to feel like something of a rockstar. Paying for a supposedly premium haircut that you don't want.